If you’re going to be staying in Buenos Aires for any length of time, learning some Spanish is a must. Though grasping the difference between “ser” and “estar” may seem like a monumental challenge, take heart—there is no shortage of options for those looking to learn Spanish. The number of Spanish language institutes, tutors and lessons in Argentina has grown exponentially thanks to a boom in tourism since 2001. The question is, which approach will work best for you? A private tutor, language institute, university, or language exchange? Here is a rundown of the options and their pros and cons. 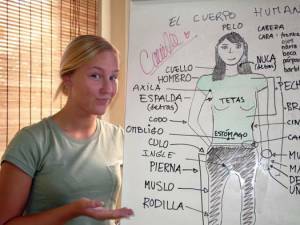 Often called an intercambio in Spanish, the idea here is to meet up with a local Spanish speaker and practice your Spanish in exchange for practicing English with them. Meeting up with someone to swap languages for free sounds like a great idea—but it’s tough to do unless you’ve already been in Buenos Aires long enough to make friends. Also, language exchanges often lack structure and coordinating your schedules can be tough. In short, intercambios are great if you in town for a few months and already have some language skills. They advertise in the newspapers (especially the English-language Buenos Aires Herald) and some also advertise on Craigslist and Facebook. The biggest issues with private tutors is that price and quality vary greatly; see if you can’t get a recommendation from a friend. Apart from that, hiring a private tutor has its advantages. The flexibility of a private tutors makes it a good option for those with tough schedules or little patience for a classroom setting. Many tutors will travel and can meet you at your residence or other location. Be sure to inquire about their qualifications and references. If they can’t provide any, best look elsewhere. Private language institutes are the most popular choice for the Buenos Aires traveler. Since 2001, Spanish institutes have popped up all over the city, mostly downtown and in Palermo. Again, quality and prices vary and any establishment should be forthcoming with prices, class structure and references. A private institute that I recommend is the Buenos Aires Spanish School. They may have an uninspiring name, but I studied there for one month and loved it. The classes are demanding, but fun and the teachers are well trained. After assessing your skills, schedule and needs, they will work with you to come up with a lesson plan. All the information you need is on their website. And then there’s the University of Buenos Aires, the most respected institution of higher learning in Argentina. UBA, as the school is called, offers Spanish classes for foreigners at their Language Laboratory. Classes at UBA are a good choice if you are spending at least one month in Buenos Aires and are willing to make a time commitment of several hours per day. That being said, there are a number of choices for the budding Spanish speaker. The most popular choice is the intensive summer class. These classes run for three weeks each; starting in December, January, and February. The classes run for three hours every week day, and you can choose a morning class or an afternoon class. Don’t worry about your level, there are teachers at the school who will test you and then assign you to the appropriate class. Summer classes fill up quickly, so be sure to go to the sign up early. To sign up, go to the university building at 25 de Mayo, number 221. You can take the B line on the subte to Leandro Alem, the building is just two blocks north of the station. If you are going to be in Buenos Aires for an extended period of time, then this option could very well be the right one for you. These courses are provided year round and they have small classes sizes and professional teachers. Courses can last from four weeks to 17 weeks—it all depends on how much time you want to spend studying. If you have a flexible schedule and time to burn, the programs offered by UBA are a great option. Programs at the Language Laboratory are taught by trained professionals and the price can’t be beat. Expect to pay between $ARG250-350. Being able to speak Spanish will make your time in Buenos Aires much more rewarding and enjoyable. The sheer variety of options for studying Spanish in Buenos Aires can be overwhelming, but arm yourself with a little knowledge (right here) and a can-do attitude, and you’ll be speaking Spanish in no time. Haven’t been to BA yet.. But are they friendly with the English? I’m a bit privy on learning the language, planning to take my wife there for our anniversary. They definitely are. In fact, I know a brit (http://buenostours.com/) or two who came to visit and never left! If you want to learn Spanish in Buenos Aires in a different way you should check http://www.MenteArgentina.Com. I spent 3 months with them and it was an absolutely amazing experience! This page rendered in 0.386 seconds.